One morning in Santa Fe, New Mexico, I briefly have 400-plus years of history to myself. I am the day’s first visitor to the Palace of the Governors, and as I wander through its rooms, I find myself contemplating how many chapters of the American story this one quietly beautiful building holds. Spanish colonization, Native American resistance and revolt, Mexican independence, the Mexican-American War, America’s westward expansion, the birth of the territory and then state of New Mexico—the palace played a role in them all. Over the centuries, it served as a presidio, a seat of government, a governor’s residence, a Puebloan dwelling, and a community gathering place, sometimes all at once. “It’s a living treasure,” Andrew J. Wulf, executive director of the New Mexico History Museum and the Palace of the Governors, tells me when he first ushers me into the adobe building, which dates from around 1610 and is now part of the state museum campus on the Plaza in downtown Santa Fe. We’ve taken a quick tour through the palace’s many galleries, which largely follow each other in a line, shotgun style, so you can see down the length of the building through a succession of doorways. The feeling is disorienting; the palace is much bigger than it appears from the outside, opening into worlds larger than its modest exterior would suggest. Visitors stroll through the portal of Santa Fe's Palace of the Governors, the longest continuously occupied building in the United States and a National Treasure of the National Trust for Historic Preservation. The feeling only grows when Wulf leaves me to explore further on my own. 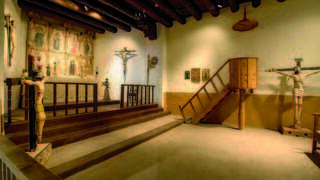 Many of the rooms are dimly lit to preserve historic artifacts such as the enormous Segesser Hide Paintings, which depict Spanish colonial life and are named after a Jesuit priest who acquired them in the mid-1700s. A small, haunting chapel holds several santos, distinctive elongated and tortured crucifixes made by local santeros, men of faith and honor in their communities who carved the sacred figures. In another room, ornate furniture and decor of the period provide a glimpse into the Victorian-era life of the family of LeBaron Bradford Prince, 14th governor of the New Mexico Territory, who served from 1889 to 1893. In another, old Spanish manuscripts tell of the first settlers in the region. In several rooms, Plexiglas panels in the floor open up to excavations of the palace’s earliest foundations. Like a living creature, the building has grown and shrunk and shed much of its skin over time. Sections of the structure have gone up and come down—walls, floors, and ceilings, too. Yet through it all, the palace has remained in use and lays claim to being the longest continuously occupied public building in the United States. As I stare at the ancient foundations, surrounded by artifacts from so many different eras, I feel as though I am traveling down the long corridor of time. Four centuries! Half a continent away, the English colony of Jamestown was struggling to survive. Across the Atlantic, Shakespeare was retiring from a career on the London stage, and Galileo was about to upset the western concept of the universe with his discovery of Jupiter’s moons. But in the foothills of the Sangre de Cristo Mountains in northern New Mexico, western settlement of the New World was already well underway, and the palace stood at its heart. Wulf calls the building a treasure, and so does the National Trust for Historic Preservation, which added the Palace of the Governors to its portfolio of National Treasures in 2015. Since then, the National Trust’s work has helped to convince state lawmakers to allocate roughly $1 million in funding for needed repairs and mechanical upgrades to the building. The organization is currently working to help the state museum secure $500,000 more in state funding to complete the improvements. Once these updates are made, Wulf says the plan is to begin a $5 million private capital campaign to reorient the palace’s galleries and exhibits. 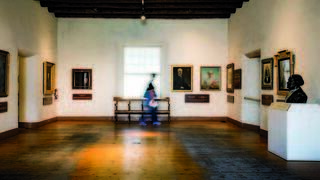 Since 1909 the building had functioned as a museum of New Mexico history, but a dedicated New Mexico History Museum opened in 2009, freeing the palace to focus more closely on its own past. “There’s so much history here,” Wulf says. “So much good, but also much that is horrifying.” After 400 years as a witness to history, the palace will get a chance to fully tell its own long and complicated story. Inside the palace's Portrait Gallery. Historical records indicate that the first Spanish families may have settled in what would become Santa Fe as early as 1604, before their seat of government was relocated there from the nearby community of San Gabriel de Yungue. After the move, they built the palace as part of the casas reales, which included the governor’s residence, the administrative center of the colonial government, and the buildings of the civil government. No archaeological drawings or records of the palace’s original design exist, but historians believe it was probably two stories tall at times throughout the 17th century and more fortress-like than the current single-story structure. It would have been built to impress—and to be defensible in case it failed to sufficiently impress. Wulf says the archaeological evidence shows that humans had lived in this region of northern New Mexico for 12,000 years. The palace was built near the long-abandoned Native American village of Ogapogeh. The foundational myth of North American settlement, of course, is that European settlers arrived in a largely empty and primitive land. In fact, northern New Mexico had more than a dozen Puebloan communities with well-established cultures, languages, and religious faiths. As the Spanish claimed authority, they suppressed local beliefs, destroying religious totems such as sacred masks, and implemented a system of forced labor that resembled slavery. Pueblo religious leaders were whipped or even hanged for practicing “witchcraft” in the eyes of the Spanish. 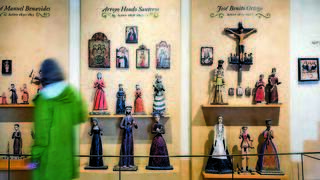 Santeros carved the small figures (known as santos and bultos) on display in the Tesoros Gallery. In August of 1680, Po’pay of Ohkay Owingeh Pueblo, a religious leader who had been jailed and whipped for practicing his beliefs, helped to lead a violent uprising of the Pueblo peoples. The rebels killed as many as 400 of the region’s Spanish residents before more than a thousand survivors retreated behind the palace’s walled plaza. After a nine-day siege, the defeated Spanish were allowed to leave, heading down the Camino Real toward El Paso del Norte while Native American warriors watched from atop the mesas. For the next 12 years New Mexico’s native people were free of Spanish rule. Oral accounts indicate that they remade the palace into a multi-story traditional Puebloan dwelling, defiantly reclaiming the space as their own. They created a warren of smaller rooms that had enough space for up to 1,000 people. The Spanish returned to take control of the region (and the palace) in 1692. This reconquest is often depicted as peaceful, but at the palace a group of Native American warriors refused to surrender. Historians believe that eight of them died in battle, two died by suicide, and another 70 were rounded up from the village and executed. The other 400 occupants of the pueblo were sentenced to serve 10 years in Spanish households. The Pueblo Revolt was not the only time the palace stood at the center of a historic shift in New Mexico’s identity. Mexico gained its independence from Spain in 1821, and 25 years later the United States entered the Mexican-American War, with the goal of forcing Mexico to surrender much of its northern lands. Gen. Stephen Kearny claimed the New Mexico Territory for the United States when he took possession of the palace from Mexican governor Manuel Armijo in 1846. He bedded down his first night there on the palace’s then-earthen floors. Over the next 60 years, the palace was occupied by various territorial governors from the United States, including Charles Bent (who, like two of his Mexican predecessors, was eventually assassinated). The Confederate Army briefly took over the building for part of the Civil War. In the late 1870s and early 1880s, Governor Lew Wallace wrote his famous novel, Ben-Hur, in his palace study. During the years leading up to New Mexico’s statehood, though, the palace outlived its usefulness. Locals who wanted to see it preserved assumed responsibility for the building in 1909 and turned it into a museum. The Mexican Governor's Office, with early 19th-century furnishings. Coming upon the Palace of the Governors on Santa Fe’s main plaza today, you might find yourself surprised and even mildly underwhelmed. At first glance, it’s an unassuming one-story Puebloan Revival structure with a portal, or covered porch, running the length of its front. A lot of buildings in Santa Fe look like that these days. But the beauty of Puebloan architecture has never been in its majesty (though some of the largest historical pueblos were majestic in scale). Its appeal lies in its organic relation to the earth and other natural building materials of the Southwest, and in the essential honesty of its approach. The Palace of the Governors’ virtues reveal themselves upon closer inspection. The thick adobe walls and the rough-hewn timbers used as vigas (roof beams) and portal columns contribute to a sense of belonging to both place and history. That feeling comes fully alive inside the palace, where deeply recessed windows, rough plaster, and the particular sense of connection to the earth that comes with adobe construction unite in a simple and timeless design. 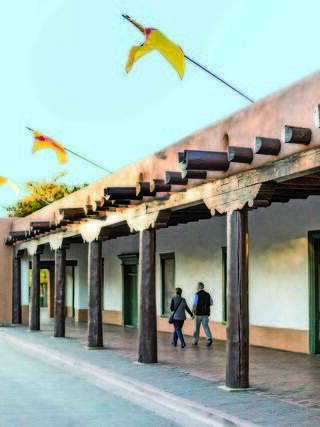 If many buildings in modern-day Santa Fe look like the Palace of the Governors, that’s because a restoration completed in 1912 helped to spur the Puebloan architectural revival that gives the city its present character. (The project involved a lot of guesswork, because rooms and architectural details had constantly been added and subtracted over time.) The restored palace’s aesthetic influence is now everywhere in Santa Fe and is even felt throughout the American Southwest. One small example: archaeologist Jesse Nusbaum, who oversaw the 1912 work, found an old corbel on the grounds that he used as a model when replacing Victorian-era supports on the portal. Wulf notes that the corbel Nusbaum copied has since become ubiquitous in Southwestern architecture. Nusbaum’s restoration was only one of many that the palace has undergone during its long history. The work that began in 2016, made possible through the $1 million appropriated by the state legislature, resurfaced much of the palace’s exterior with lime plaster. The plaster replaced concrete stucco, which can be damaging to adobe because it doesn’t allow it to breathe properly. Much-needed upgrades were also made to the HVAC, electrical, and fire-suppression systems. Crucifixes on display in the chapel. Those challenges are often connected to state budget crunches. New Mexico’s oil and gas industries have been hurt by low prices, and the state’s economy has faced a severe squeeze. Yet the palace’s historic significance helped convince lawmakers to support the most recent restoration and renovation work. That commitment reflects not just the palace’s history, but also its continuing relevance. Whether you visit on a balmy summer morning or on a chilly winter afternoon, you’ll find dozens of Puebloan vendors on the front portal selling their carefully crafted wares. The state museum has worked with native vendors for several decades to continue this century-old tradition, now known as the Native American Artisans Program. The artisans’ work attracts visitors from around the world to a palace—occupied at different points by Native Americans, Spaniards, and Mexicans—that has become a U.S. national treasure. In other words, the palace’s story remains an ongoing part of the American story. “Its history goes way back, and yet it’s very reflective of the multicultural nature of America today,” says Webb. 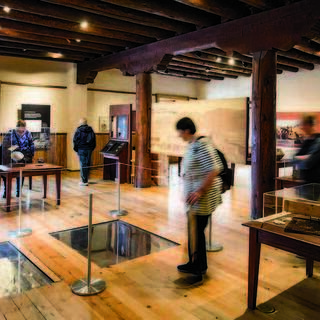 Along with a gallery devoted to the Pueblo Revolt, Wulf hopes to create exhibits on some of the 101 governors from three different nations who ruled from the palace; the experiences of those who lived and worked there over the centuries; and the building’s rich architectural and archaeological legacy, among other ideas. He believes the palace can “open up the conversation on this history, this very complicated history—looking at the gray areas, because it’s not just black and white,” he says. Reed Karaim, who grew up in North Dakota, is a freelance writer now living in Tucson, Ariz. His work has appeared in Smithsonian, The Washington Post, The American Scholar, Architect, and U.S. News and World Report, among others.